The lace bralette has been on the rise for quite some time and has easily become one of the biggest latest trends. When it comes to styling, lace bralettes are worn underneath clothes, so that the straps complement a top or dress (my personal preference), or they are worn as a top itself, showcasing most of the chest part of the bralette through a low-cut or cutout shirt or dress. In regards to style, my top two picks are the racerback bralette and the halter bralette. 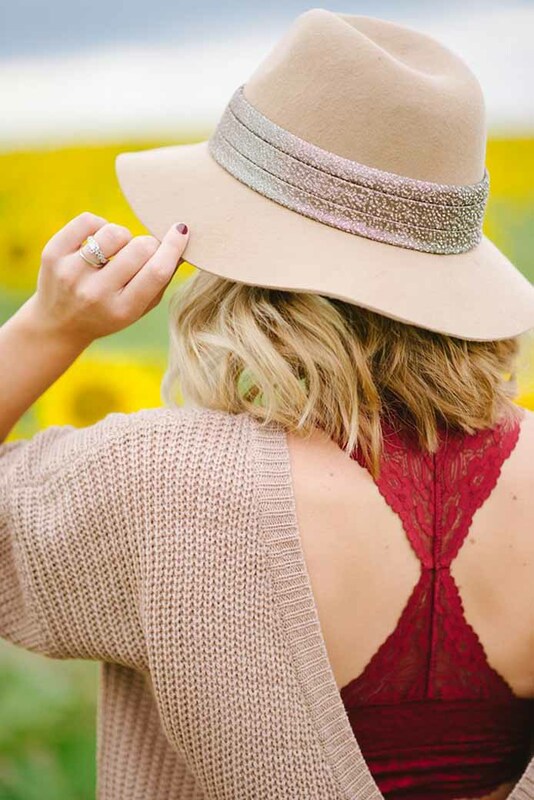 Lace bralettes add a feminine, bohemian vibe to any ensemble—even a preppy look. Racerback bralettes look great when paired with sleeveless dresses, tops, and even sweaters that expose the upper back. With this style specifically, the beautiful lace detail of the racerback is subtly featured, but eye-catching. Halter bralettes complement simple, flowy scoop neck tees and sweaters. Another pairing option is a halter bralette with a sleeveless dress or top that has an A-line neck. Don’t be afraid to wear both racerback and halter bralettes with an off-the-shoulder sweater, shirt, or dress, either! Now let’s talk about color coordination. If you’re wearing a pattern, you can’t go wrong with matching your bralette to one of the colors found in the pattern. Sometimes off-white looks fantastic with a patterned top or dress, even if off-white isn’t one of the colors in the pattern. One of my personal favorite color combos between a top or dress and a bralette is mustard yellow and cobalt blue. I think these bright, bold colors complement one another very well. And if you’re wearing a solid color top, any color bralette is fair game. It all comes down to picking the colors in which you feel most beautiful. Have fun mixing and matching and finding new color combos that you love. It all comes down to picking the colors in which you feel most beautiful. Currently, my favorite brand of lace bralettes is Free People. The price point is $35.00 per bralette—but these bralettes are great quality. My favorite store that carries Free People bralettes is called EverEve. If you don’t have an EverEve in your area, you can go to their website to shop. However, if you’re on a tighter budget, you can grab many styles under $10 at the Etsy shop Vutiq. When it comes to sizing, I encourage you to go into a store to try on a couple different sizes. One sizing detail to pay attention to when searching for the perfect bralette is how supportive it is for your chest. If you are blessed in your chest area, you may want to try American Eagle or Victoria’s Secret. It’s crucial to know what style of bralette is most flattering on you while feeling comfortable. After all, I believe beauty is comfort, not pain!